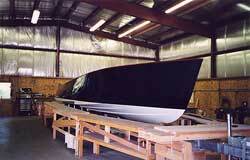 Miss Universe is a 33' vee bottomed stepped hull race boat. 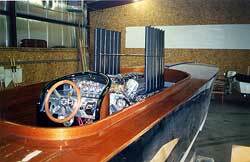 She was designed to be used as a platform to run antique V-12 airplane engines. Her engine pictured here is a Curtiss V-12 built in 1930. 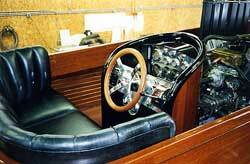 The entire boat is of mahogany. 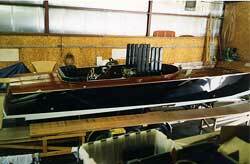 She was built in my Essex, Vermont shop with the help of my friend, master boatbuilder Peter Russett. Let me tell you, that when you touch off that old 12 cylinder Curtiss airplane engine with those 12 straight pipes it makes your heart cavitate in your chest.